Yes, you can draw! And this book will show you how. By the time you finish reading, youll have all the skills you need to sketch a convincing clothed figure in 15 minutes. Artist, life drawing expert, and best-selling author Jake Spicer takes you through a series of carefully cra!ed tutorials, from how to put together a basic sketch of a person to developing your drawings and taking them further. 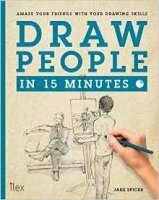 From materials and set-up to mark-making, spatial relationships and how clothes hang on a body, every aspect of the figure drawing process is examined, with a special emphasis on guerilla sketching in public places: cafes, trains, buses, and anywhere that people are to be seen in action.